DO OUR MOVIES MEASURE UP? There is a world in which women play such minor roles that no more than two are ever named. Anything that happens solely concerns men — so much so that no two women ever talk to each other. When they do, the subject that brings them together is men. Appalling? And yet, anyone who consumes pop culture knows this world does exist: It’s the world of movies, conceived of and produced by a multi-billion-dollar industry dominated largely by white males at every level, from writer to director to producer. 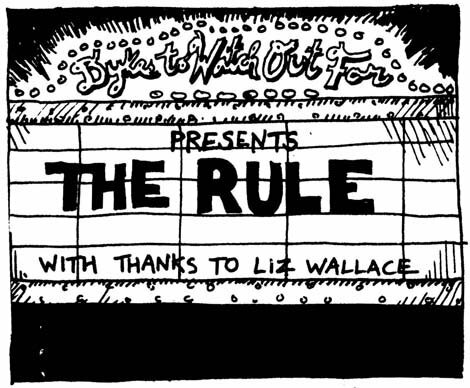 And as Alison Bechdel so aptly called attention to in a 1985 comic strip called “The Rule,” in mainstream movies — the kind most of the world is seeing — women are bit players in more ways than one. What’s come to be known as the Bechdel test has three requirements: A movie has to have at least two named women, they have to talk to each other, and the subject of their conversation has to be something other than men.” The Bechdel test is the rare feminist concept that has entered mainstream popular culture, and, as if to prove its creator’s brilliance, Bechdel — a prolific cartoonist and author of several graphic memoirs — won a MacArthur “Genius” Fellowship this year. Perhaps the Bechdel Test has been able to so permeate our national consciousness, or at least the blogosphere, because though it is simple, so many movies fail to meet it. Some of the biggest losers are also the biggest movies of our time, including Avatar, the whole Lord of the Rings series and The Social Network. The Bechdel Test’s underlying agenda is not particularly new. As Alison Bechdel herself acknowledges, the call for more complex, nuanced portraits of women is practically as old as writing itself. But the Bechdel test has made more inroads than most. In Sweden, movie theatres have even begun rating films on how well they met the test. Think about the last time you saw a movie — or for that matter, watched a TV show or a play, read a book, even saw a commercial — and noticed strong, compelling, nuanced portraits of women, women who laughed and cried and stressed out over the kinds of things real women do. The reality is this: Women talk to each other, a lot, and yes, we do talk about the people that we love, or just like a little, or are wildly or not-so-wildly attracted to. We also talk about our careers, and our mothers, the books we’ve read, our dreams, people we unjustifiably hate, and people we justifiably hate. We talk about problems we see in our communities and ideas we find intellectually stimulating. We pacify each other; we challenge each other, feed each other. And the majority of movies — even some of our favorites, like Her and The Hobbit — deny the complex kinds of experiences that are part and parcel of being a woman, not to mention denying the very existence of women who love other women, women who don’t love anyone, women who love men and women, and women who love without regards to gender at all. Ultimately, there are stories to be told about women independent of romance and love. That’s not to say all stories about women need to exclude men — in fact many women form relationships thanks to, or despite, men, and I don’t think all the stories about women and men have yet been told — but women certainly must be established as characters independent of men in order to have significant relationships with them. And what’s exciting about the kind of name recognition the Bechdel test has acquired is that the language of and conversation about gender parity has spread beyond feminist activists and bloggers, to the point where creators of television shows are thinking actively and speaking openly about the role women play in their creations. Not passing the Bechdel test has become a form of public shaming, and data analysis performed by Walt Hickey of FiveThirtyEight found that movies that pass the test may even perform better at the box office. But there is a world — our world — in which women are the main characters. There are many of them, and they talk to each other about all kinds of things: about books and their careers, politics, their love interests, their favorite wines, the quest for an open elliptical at the gym in mid-afternoon. The Bechdel test is a warning bell, a reminder of the rich and complex lives we and the women around us lead, as much as it is a call to action — to expect more of our movies, to advocate for them to be representative of the world that we live in and to never stop until that is the case.